Our solutions are adaptive to any type of technology as our engineers constantly aim at developing the best global systems to efficiently respond to our clients’ needs. As our core business, biometrics guarantee the uniqueness of each identity. Our Biometric Network System ORBIS gathers all data relative to a person. 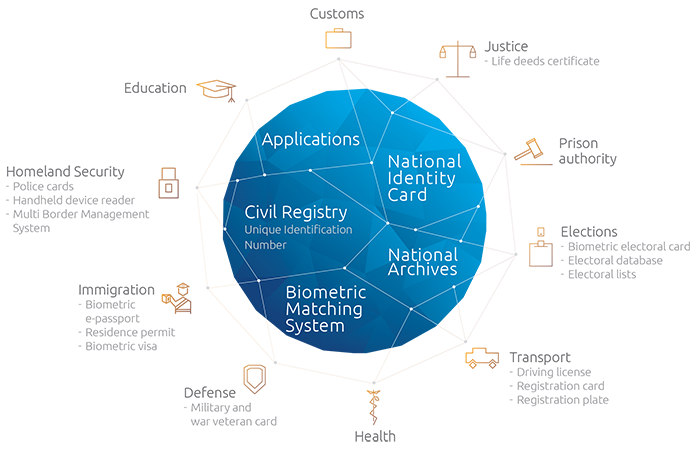 With these data, virtually any type of identity documents can be integrated. In the system suggested, these documents are secured by the use of biometrics which has the advantage to authenticate any type of documents, whatever the medium. The use of the fingerprints on the documents ensures that the person matches with the one making the request of it. In any case, whatever how secured is a document, only the use of biometrics ensures that the person is really the one represented on the document. It is truly a pledge of safety and uniqueness of the identity. The start-up operations are conducted by SEMLEX, the software is adapted to the specificities of the project, the hardware and software are implemented and the team is set up and trained. The whole system is left to the authorities fully working. A maintenance contract can then be signed between the two parties. SEMLEX is offering to implement biometric systems for diverse documents and databases, and to produce such documents. In reply to this request, SEMLEX undertakes, as part of the ongoing necessary investments, to implement all hardware and software resources, to build its team, and to carry out the supervision and training of the officials involved in the project. Under this type of contract, the State not only invests few or no money, but receives a part of the revenue. In order to provide a reliable system of identification, Semlex has developed a central solution called ORBIS (Organisation for Biometric Identification system). SEMLEX implements the technologies and the necessary resources to build your Central Biometric Identification System. Our know-how on the field allowed us to conceive the populations management tool, necessary to all Governments of the 21th century. SEMLEX Europe relies on a broad experience in development, integration, operational management and supply of high technology systems in identification and authentication. Copyright © 2015 Semlex Group.